Direct Drive Rotary High Vacuum Pumps Direct Drive Rotary High Vacuum Pumps These pumps belonging to series dhve are designed to work non-stop without any problem, for a long period of time. These are Direct Drive, Double Stage, Oil Sealed, Rotary High Vacuum Pumps wherein, State of the Art technique has been adopted to ensure proper alignment and the fine setting of each & every component used, remain ever undisturbed. The main components of the pumps are made out of the selected superior quality raw materials, which mainly consist of specially treated Cast Iron and Steel. The pump is coupled directly to the Motor shaft without using any additional coupling which not only makes it compact, but also ensures its powerful positive drive sufficiently noiseless. Features Fast Evacuation, Extremely Light Weight, Portable, High Vacuum Generation, Specially treated Vanes for longer life, Low temperature rise, Low Noise & Vibration free performance, Economical, Low-Current Consumption, Versatile Models Applications Gas Charging in ACs and Refrigerators, Car AC Servicing, Laboratories, Research & Development Units High Vacuum Systems, Scientific Equipments, Food Processing Units, Printing and Film Processing, Air Sampling / Environmental Studies, Vacuum Forming, Electronic & Electrical Industries. DINESH HIGH VACUUM ENGINEERING Company Profile http://vaccumpumpmanufacturer.com DHVE Vacuum is the industry leader in the manufacture and distribution of high quality vacuum pump fluids. DHVE Vacuum was founded in 1972 in SHD, DELHI. For over forty years, we have offered our customers quality, cost effective vacuum fluids necessary to meet the changing technology in high vacuum systems. Product Lines High vacuum mechanical and diffusion pump fluids Turbo molecular pump fluids Heat transfer fluids High vacuum greases and waxes Inert PFPE and CTFE vacuum pump fluids Preventative maintenance products Fluid reclamation services Custom distillation Products, Services, and Markets DHVE Vacuum manufactures and distributes a complete line of mechanical and diffusion pump fluids for all pump types and vacuum applications. Since vacuum fluids are our primary business and not a sideline, DHVE has made the manufacture of vacuum distilled products our area of expertise. In support of our broad range of vacuum fluids, DHVE also offers a line of preventive maintenance products, heat transfer fluids, and high vacuum greases and waxes. dhve’s services include custom distillation of fluids and a reclamation service for used fluids. dhve’s mechanical pump fluids are vacuum distilled paraffinic hydrocarbons containing no aromatic or viscosity improvers that are lost during oil filtration. Compared to undistilled vacuum pump fluid, dhve’s pure vacuum mechanical pump fluids provide excellent lubricity, oxidation resistance, lower vapor pressure, and four to ten times longer fluid life. dhve also offers a complete line of complimentary PFPE and HaloVac inert vacuum pump fluids. dhve Vacuum also offers a broad line of diffusion pump fluids for a wide range of applications. These fluids include distilled hydrocarbons, silicones, organic esters, and other synthetics. Preventive maintenance products include flushing fluids, solvents, acidity test kits, and vacuum service safety carts. 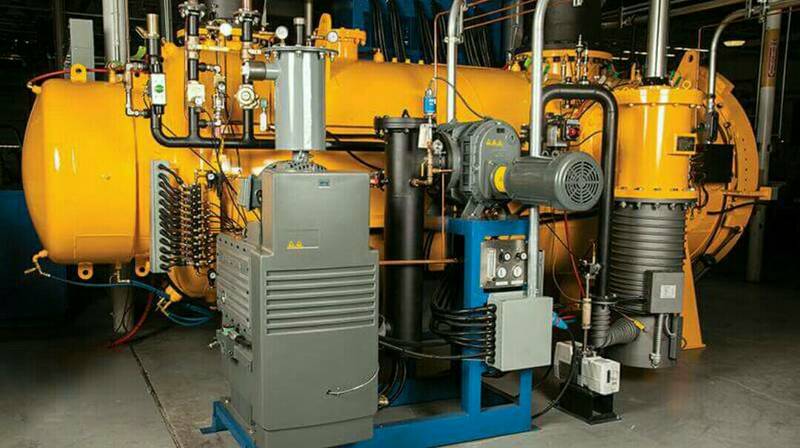 Regular preventive maintenance practices will lengthen the life of a pump, reduce costly down-time, reduce the cost of repairs, and optimize performance levels. In response to customer concerns over rising cost and ecological waste problems, dhve Vacuum has developed a reclamation process for used or contaminated pump fluids. This serves to recover or prolong the life of both mechanical and diffusion fluids. dhve’s reclamation process will produce a high-yield, quality product that meets the performance specifications of new fluid. Through the stringent testing procedures done on reclaimed fluids, dhve can guarantee a fluid that meets or exceeds original specifications.Our research department, which is always committed to new product development, works closely with both end users and pump manufacturers in order to be the leader in vacuum pump fluids. Through this association, dhve has learned to manufacture vacuum fluids that enable vacuum pumps to attain optimal performance for all applications. Our Commitment to Quality As a commitment to our high quality standards, dhve has instituted a Statistical Process Control Program, which constantly monitors critical control operations ranging from inspection, production, and packaging. Using the Statistical Process Control Program, our engineers can immediately observe any statistical variations in process production and make appropriate on-line corrections, enabling complete adherence to dhve’s manufacturing specifications and stringent quality requirements. All fluids that dhve manufactures are batch tested and must conform to strict viscosity and low vapor pressure specifications. Each batch is numbered and samples are kept for future reference. Our strict quality procedures insure a product that is recommended by major pump manufacturers. Our products are marketed worldwide and are used in a number of various industries. Our customer base is exceptionally broad, ranging from small proprietorships to major manufacturers and research institutions throughout the world. DIRECT DRIVE VACUUM PUMPS These pumps belonging to series DHVE are designed to work non-stop without any problem, for a long period of time. These are Direct Drive, Double Stage, Oil Sealed, Rotary High Vacuum Pumps wherein, State of the Art technique has been adopted to ensure proper alignment and the fine setting of each & every component used, remain ever undisturbed. The main components of the pumps are made out of the selected superior quality raw materials, which mainly consist of specially treated Cast Iron and Steel. The pump is coupled directly to the Motor shaft without using any additional coupling which not only makes it compact, but also ensures its powerful positive drive sufficiently noiseless. Features Fast Evacuation, Extremely Light Weight, Portable, High Vacuum Generation, Specially treated Vanes for longer life, Low temperature rise, Low Noise & Vibration free performance, Economical, Low-Current Consumption, Versatile Models Applications Gas Charging in ACs and Refrigerators, Car AC Servicing, Laboratories, Research & Development Units High Vacuum Systems, Scientific Equipments, Food Processing Units, Printing and Film Processing, Air Sampling / Environmental Studies, Vacuum Forming, Electronic & Electrical Industries.